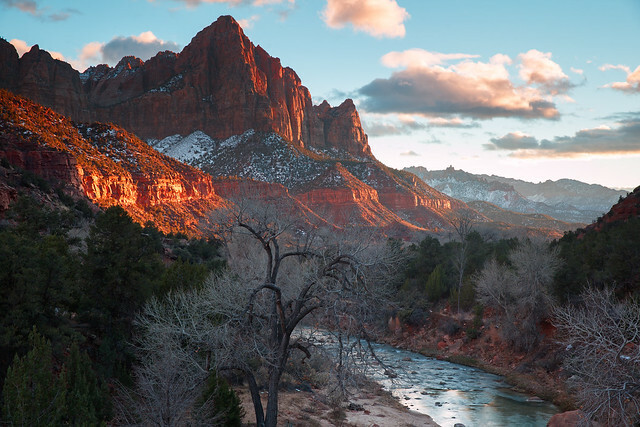 Why Visit Zion In The Winter? Zion National Park is a very popular tourist destination in Utah. Tourists from all over the world travel here to see the fantastic views and experience some of the most magnificent hiking in the world! The warmer seasons such as spring and summer are the more popular times of the year to visit due to the weather. However, many people fail to realize that one of the most magical times of the year to visit the park. Though there are chances that hikes and roads may be closed at times due to weather, it is not uncommon for the weather to be quite mild during winter in Zion. Due to its location in southern Utah, Zion is considered desert climate, with occasional snow fall during the winter. Thankfully snow rarely falls and sticks in Southern Utah, making hiking and sight seeing just as enjoyable as during the warmer months. It can even be more of an adventure if you dare to take on hikes such as Angels Landing! This is because of the rewarding and spectacular view you will get from atop the peak. With the snow contrasting hard against the red cliffs that surround Zion, it can be quite the view to take in. One that is beyond breathtaking. There are many other activities to do while is Zion during the winter as well. Such as scenic drives, cross country skiing, backpacking and more! There really is no bad time of the year to visit Zion. https://www.bumbleberry.com/wp-content/uploads/2016/03/BumbleberryInn-Logo-shrink-2.png 0 0 Zion Bumbleberry Hotel https://www.bumbleberry.com/wp-content/uploads/2016/03/BumbleberryInn-Logo-shrink-2.png Zion Bumbleberry Hotel2016-11-03 18:49:292017-01-03 18:50:06Why Visit Zion In The Winter? Helpful Zion Tips & Tricks Reasons To Get Outdoors!